At the westernmost tip of Sicily, Marsala is an ancient city with a complex and fascinating history born of its western-coastal location. On every trade and conquest route for millenia, Marsala was inevitably planted with vines along the way, leading eventually to the very particular wine tradition for which it has been known globally for over two hundred years: a fortified wine combining many aspects of Madeira, Sherry and Port, known still today as Marsala. Marsala wine was not known or commercialized abroad until it was "discovered" by a visiting English merchant named John Woodhouse in 1773. He shipped some of it back home, many more merchants followed and set up a shop, and thus was born the modern Marsala trade. The harbor and shipping companies developed apace, and the solera system of aging established in Madeira and Xérès was introduced into the vinification and aging of Marsala. Marsala joined the pantheon of internationally esteemed, historical, fortified wines of Port, Madeira and Sherry. Alongside the growth of the wine industry, the city of Marsala remained a critical political and military crossroads. Garibaldi landed his troops here in 1860 to begin his march northward to unify what was then a fractured patchwork of territories into the modern-day country of Italy; the Allied forces in WW2 bombed it thoroughly in 1943 to eliminate it as a useful port. Throughout, the wine trade survived and thrived, with over 100 wineries producing Marsala by the 1900's. The city was perfectly positioned for worldwide exports, and the prolific emigration of Sicilians to the U.S. also meant that the real Marsala entered American wine culture on some level as well. The noble history and tradition of Marsala wine was compromised gradually as the industry modernized and commercialized in the 20th century. By the 1960's, co-op production dominated. Various grapes of shaky origin and ripeness were used indiscriminately for the wines; the addition of cooked, caramelized grape must became a common shortcut to sweetness and color. Such compromises of tradition and technique completely compromised the international reputation of Marsala wine, and sales slumped worldwide. Rarely was "Marsala" seen anywhere in this country except in ersatz renditions on grocery store shelves to be used for cooking; unfortunately, that reality and reputation remains largely intact in the States today. Enter Marco De Bartoli, whose grandmother had married in her youth into one of the two largest Marsala-producing families (Pellegrino, the other being Florio) of the time . As a child, Marco did some family farm and vineyard work, but as a young man, he left his agricultural roots behind to build a successful career as a race car driver. Eventually he returned to those roots, a scion determined to revamp the family business and Marsala's reputation. Several steps were key to rehabilitating both. First came Marco's reconstruction of the old cellar on his mother's property in the contrada (quarter) of Samperi outside of the city of Marsala. The next vital step was his searching out of old solera barrels of aged Grillo wines from local farmers, who were more than happy to sell off or give away these seemingly worthless relics of a dead past. These small stocks were a way to hit the ground running with already-aged Marsala. The next piece of the puzzle was the plantings of vines, Grillo only: Grillo ripens with a high level of potential alcohol while maintaining acidity, making it the best candidate for quality Marsala. From the outset, the vines were organically farmed and harvested by hand. What is important to remember about this seemingly traditional-sounding basis of the revitalized De Bartoli winery is what was and is decidedly atypical of Marsala wine history and production: the use of estate-only fruit; the Grillo-only focus for their Marsala; chemical-free farming; hand harvest in a machine-driven wine region; fully ripened, unchaptalized grapes; fermentation with indigenous yeasts only; fortification with only De Bartoli-crafted mistella containing exclusively estate grape brandy and fresh grape must; and a commitment to lengthy, often solera-based, aging. In the context of the modern Marsala wine industry, De Bartoli's Marsalas are truly rare and special and have re-set the standard in favor of quality over quantity. The story does not end there. There were two more significant expansions of the De Bartoli repertoire. In 1984 Marco acquired vines and a winery on the island of Pantelleria--closer to Tunisia than Italy--where De Bartoli produces the local, traditional wine: an unfortified passito from the best local white grape, Zibibbo (classified in modern terms as DOCG Passito di Pantelleria). Then in the 1990's, as his adult children Renato, Sebastiano and Giuseppina joined Marco in the family business, they made the move into dry sparkling, white and red wines. Not surprisingly, they did not follow their neighbors down a bulk-wine, or internationally-styled, path in this realm either. The wines are based entirely on local varieties (whites and sparkling from Grillo & Catarratto from Marsala and Zibibbo from Pantelleria, and red Pignatello from Marsala); owned and farmed by the family organically; harvested by hand; made in a modern, temperature-controlled environment; fermented with natural yeasts; made with whole-cluster fruit in some cases; and including skin contact for some whites to add phenolic complexity. None of this is the standard for wines made in western Sicily. Having resuscitated a moribund, musty and misunderstood wine style virtually singlehandedly, Papa Marco passed away in 2011 at the age of 66. 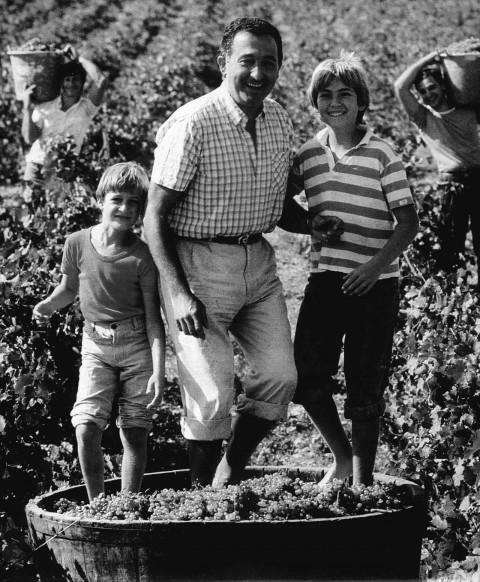 His three children continue to carry the De Bartoli flag and his commitment to quality-driven, estate-grown wines that walk the line between old-fashioned and modern in the most graceful of ways.